Spaceship Eyes - "Of Cosmic Repercussions" / Quiet Celebration - "s/t"
Nobody can accuse Don Falcone of being boring. In fact, of all the people I've been following these past few years Don's projects have produced some of the most interesting and exciting music in terms of variety. Don has two new releases out this year, each of a very different flavor. My impression of the third Spaceship Eyes CD is that it occupies something of a middle ground between the first two, and is a clear leap ahead of both of them. 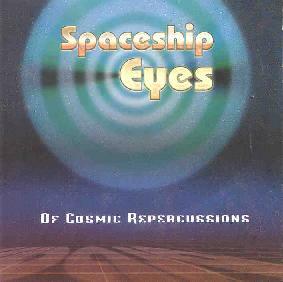 The first Spaceship Eyes release, Kamarupa, was a Tangerine Dream styled electronic space album, and the second, Truth In The Eyes Of A Spaceship, saw Don exploring techno and drum 'n bass territory. I'm not very tuned into the dance/rave underground, but what I enjoyed about Truth was that the dance elements were accompanied by music that was sufficiently varied that it was well beyond being mere dance music, and included LOTS of freaky sounds and fun that I enjoy so much. Of Cosmic Repercussions is really more of an extension of Truth than it is like Kamarupa. If this is being played in dance clubs than I wonder if people are stopping and listening because the music is so multi-layered and busy that I catch more and more with each subsequent listen, which I attribute to its excellent production and sound quality. There's also a variety of players and instrumentation besides synths including guitar, violin, and real drums including Tabla and Bayan. How many rave records have you heard with Tablas! Speaking of Tablas, one of my favorite tracks is the rocker "Big Martian Dog Hop". It's got a frantic rave feel, but the Tablas are in there adding to the rhythm. I was nearly sweating from the pace of this tune, though there are the briefest of interludes where I could catch my breath... if I was quick. There are lots of cool spaced out dance tracks but there are a couple tunes that were a bit different too. "Keep Yourself Healthy" has some great jazzy funk guitar, which along with the rhythms, subtle freaky synth bits, and all-around atmosphere give it a bit of a late 60's Miles Davis feel. And while there are a few vocal numbers on the CD, "All The Rubies" is the one real "song". It has some nice fuzzed out and wah'd guitar chords, and guitarist Jerry Jeter has a great voice so maybe we'll hear something more from him on the next Spirits Burning collaboration. Having a solid foundation in spacerock and progressive rock makes Don uniquely qualified to make complex and exciting dance music that AI readers can appreciate. At least that's the conclusion I've drawn from listening to Of Cosmic Repercussions. And if this music isn't unique among dance/rave bands, then I'm missing something I should be further exploring. Quiet Celebration is a very different undertaking, being a combination of ambient space music with jazz, classical, and world music. The band is a quartet of Don Falcone on synth and Udu, Edward Huson on Bayan and Tabla [he also appears on Of Cosmic Repercussions], Ashley Adams on contrabass, and John Purves on woodwinds. I love the mixture of ambient space with real percussion, and this is what drew me into Don's world when I was first introduced to Kamarupa a couple years back. 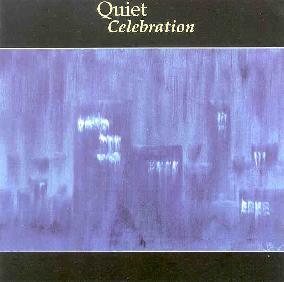 On Quiet Celebration, not only is this combination featured prominently, but the addition of the contrabass and wind instruments make for an excellent example of space music made more exciting by the presence of all these acoustic instruments. The music is sometimes eerie, but is, overall, uplifting and has a spiritual quality. I even detect at various times some Native American and Oriental influences. Imagine Shadowfax without guitar and you'll get something like Quiet Celebration. In summary, there's nothing particularly complex or sophisticated about Quiet Celebration. But I really enjoyed hearing spacey cosmic synths being an equal partner with the acoustic instruments. If Of Cosmic Repercussions picks up where Truth In The Eyes Of A Spaceship left off, then Quiet Celebration elevates the music created on Kamarupa to new heights of space ambient elegance. For more information on Don Falcone's Spaceship Eyes project you can visit their web site. You can also visit the Quiet Celebration web site. While there, click the Spirits Burning link to get information on that project as well. You can contact Don Falcone via snail mail c/o Noh Poetry Records; 2248 Fiji Way; San Leandro, CA 94577.